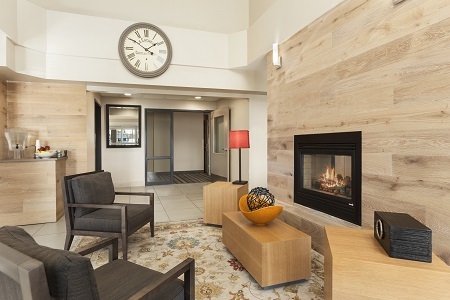 Located less than seven miles from Minneapolis-St. Paul International Airport (MSP), the Country Inn & Suites® by Radisson, Eagan, MN is the perfect place to rest outside the Twin Cities. We offer convenient shuttle service to nearby attractions and local corporate offices as well as to and from the MSP airport. To reserve long-term airport parking at the hotel, guests can book our Park and Travel Package (subject to availability). When it’s time to relax, enjoy a dip in our heated indoor pool or a soak in our hot tub. Traveling with family or need extra space? Reserve one of our studio-style suites to enjoy either one king or two queen beds, an open floor plan and all standard amenities. 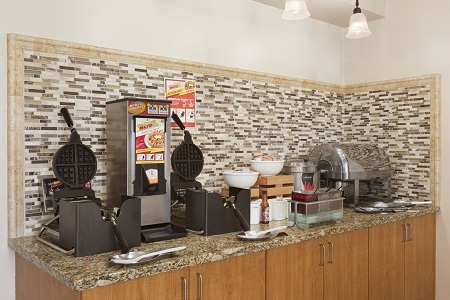 Start your day off with our free, hot breakfast, featuring waffles, pastries and a rotating selection of hot items. Our location is within five miles of several great lunch or dinner options. Dickey’s Barbecue Pit dishes out mouthwatering pulled pork and home-style sides, and Jake’s City Grille serves up wood-fired pizza, Tex-Mex and classic American cuisine. Mall of America – Just 11 minutes from the hotel, this shopping center is home to more than 500 stores. For added fun, head to the indoor amusement park and aquarium. Nickelodeon Universe offers two roller coasters and several thrill rides, and Sea Life Mall of America Aquarium includes a 300-foot-long tunnel for you to walk through with sharks, stingrays and other creatures swimming overhead. Science Museum of Minnesota – This museum features a hands-on experiment gallery, exhibits on the human body and a constant rotation of special exhibits. Drive nine miles from the hotel to walk through the Dinosaurs & Fossils display, and come face-to-face with one of only four complete Triceratops skeletons in the world. Minnesota Zoo – This famed zoo, only 10 miles away, houses more than 400 species of animals in six exhibits built to resemble the animals’ natural environment. Find yourself in the heart of the rainforest when you walk the Tropics Trail, and visit with animals rarely seen in other parts of the world, including Komodo dragons, red pandas and ring-tailed lemurs. 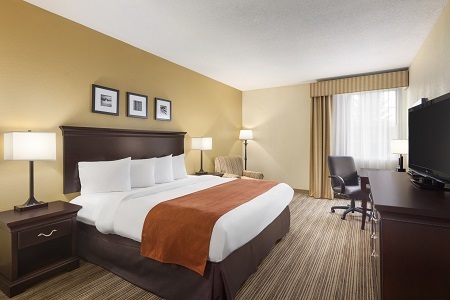 Located only eight minutes from the MSP airport, our hotel is ideal for your business conference in Eagan. We offer meeting space capable of seating up to 40 guests, and our friendly staff is on hand to assist with everything from event setup to catering arrangements. The Country Inn & Suites, Eagan is under new ownership.